The road that leads to Camp Denali & North Face Lodge winds ninety miles into the subarctic, through sweeping valleys and craggy mountains, beside braided riverbeds and kettle ponds, over windy passes and around the snowy foothills of the Alaska Range. On the five-hour trip you may glimpse grizzlies, moose, caribou, wolves, beavers, Dall sheep, ptarmigan, fox--but, aside from other vehicles, a handful of ranger stations and the visitor’s center, you’ll see little in the way of human life. It can feel a bit surreal, then, when the bus turns off the road at mile 89, cabins begin to appear through the spruce trees on the hillside, and suddenly the bus is surrounded by a bunch of friendly, well-fed-looking people who clearly feel at home in this place. In a few days, maybe even an evening, you might start to feel that way, too. Camp Denali & North Face Lodge isn’t a hotel, and it’s not a resort, and it doesn’t even have a mailbox on site. If anything, it’s more like a tiny village. This village began with a bear cache, which still stands, almost seventy years later, sturdy on its stilt-legs, gazing out at the mountains. Using logs they felled, peeled, dragged home by hand, and finally fit into place using sphagnum from the surrounding tundra, the founders began to add permanent infrastructure to the site they chose with a broad view of the mountains in mind. Over the years, thousands upon thousands of building projects, supply runs, and well-executed ideas have built a permanent stock and structure of everything a human might need at home in the wilderness. But there’s more to home than walls and warm meals. Like a home and like a village, this is a place of stories, which is another word for connections. It is an old place, and its history is woven into the wildness of nature and the track of human triumphs and travails that formed life as we know it in the Kantishna Valley, the Park, and the state of Alaska. It’s a place where you might break bread with the person who sewed your cabin curtains, the biggest rumor going around is that a moose and calf appeared in the pond during breakfast, and every building has its own name--Arnica, Sluice Box, Aurora, Potlatch--and a story that comes with the name. You’ll learn the stories of the wilderness, residing right smack dab in it, alongside naturalists and all others who come because they love the wilderness and want to witness it. You may learn to recognize animal prints, to understand why the lynx has such long legs, and to imagine the great glaciers that once traveled across the tundra, shaping the ground you walk on. And of course, you can’t discount the people--staff and guests alike. They’re who really make it magical. You’ll meet them, too. When it’s time to ride the bus ninety miles back down the road, you’ll leave with stories of your own. You’ll perhaps wonder how you’ll describe this place to your friends and family. 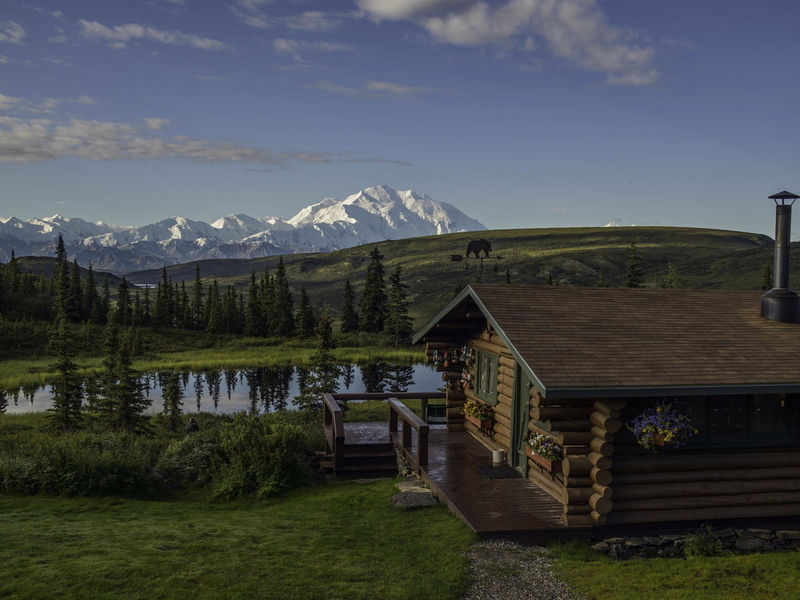 It’s hard to explain a place like Camp Denali: there’s just nowhere else like it.